THE ULTIMATE BEACH LOVERS' HOLIDAY! Imagine stepping off your pool deck straight onto the warm sands of the beautiful and private Sapphire Beach. This is exactly what you will experience at Sapphire Seas Beach House, your idyllic luxury beach front holiday home. The house boasts 4 large bedrooms, 3.5 limestone bathrooms and around 450sq/m of living space, comfortably accommodating 11 people. It's the perfect holiday for 1 or 2 families or group of friends. The ground level is devoted to resort-style living boasting a large entertainment room with TV and Foxtel which flows seamlessly to the generous pool deck. Laze poolside or enjoy a beachside BBQ with the stunning sapphire blue ocean just footsteps away. The master bedroom with king bed enjoys beach and pool views and has an exquisite ensuite bathroom with spa bath and adjoining dressing room. Just off the entertainment room is a small bedroom with double and single bed perfect for the kids with powder room nearby. Upon venturing upstairs you will enjoy the well thought out luxury of the open plan kitchen, living and dining room area creating a wonderful feeling of space. Upon opening the expansive concertina doors you invite the alfresco entertaining deck into the house, all with uninterrupted beach and ocean views. There are two remaining bedrooms, one with two queen beds and another with king bed. Both of these oversized bedrooms boast their own ensuite bathroom and covered balcony. 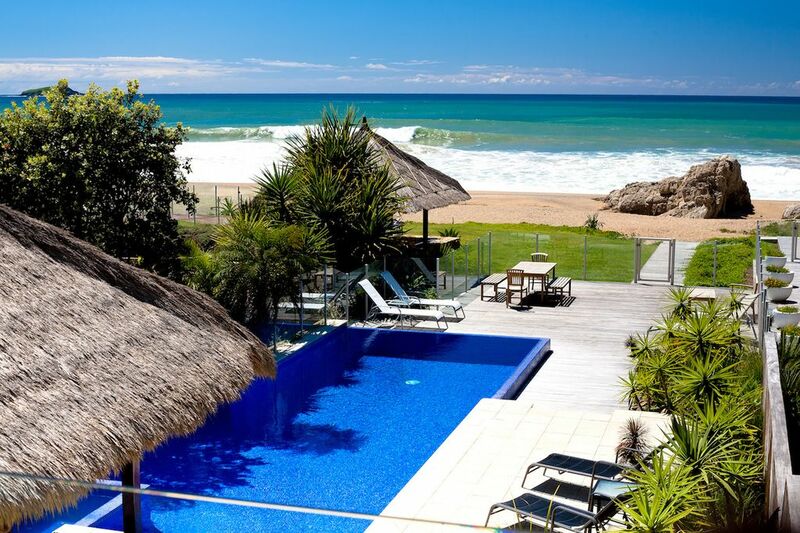 • Enviably located in Coffs Harbour’s most exclusive private beachfront estate. - Minimum 3 nights stay. Shorter stays - POA. We are situated on absolute beachfront...that means no roads or pathways separating the house from the beach! We had a great time at Sapphire Beach. The house is beautiful and well appointed. Unfortunately the ocean was far too rough to swim, but we enjoyed walks on the beach and swimming in the pool. Fantastic home on the beach with everything you could need. Suited our family so well with enough space for everyone. Awesome pool and great overall. exclusively finished property in quiet secure location. Just stunning views. Serenity and relaxation is what we intended to pay for and we got this in spades.A long awaited time out for us as a couple and we were so thankful we saved for the best.and Sapphire Seas Beach house delivered it in spades. Everything about this house was perfect. It has the most incredible location and views. We felt instantly relaxed. It's super stylish, very clean and had everything we needed. Lisa our host was very cheery and helpful. We can't wait to stay again in the near future. Outstanding! We had the most wonderful stay at this amazing property. The house is just great - really well laid out, modern, beautifully and (importantly for us with young children) practically furnished and extremely clean. The pool, jacuzzi and cabana are resort-like, and so relaxing with the beachfront outlook. Lisa is a great host, always available and prompt when we had questions. Highly recommend! A special property in a special location which allowed us to have a special Christmas. This house is everything the promotional images portray and even more. The house itself has all the conveniences & items you need for all occasions which allows you to have a relaxed stress free holiday . The pool, spa & surrounds are sensational and the proximity to, and outlook over the ocean all translate into a stay which would rank as difficult to equal anywhere in this country.